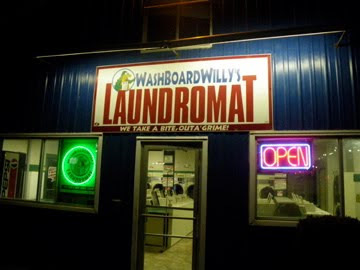 This River is Wild: Washboard Willy's. The climb out of Oak Orchard and back to the truck was strenuous. Two long days on the water with little more than a few granola bars and some cans of Red Bull left my body weak and parched. Despite having two very successful days of fishing on the Salmon and Oak, my mind began to wonder. It was Thanksgiving and all I could think about was turkey and pumpkin cake roll. At the truck, I downed a blue Powerade, which is probably my favorite drink after a day of fishing. We unpacked our stuff, took off our soaking wet clothes from the days rain, and decided to spend the night at Walmart once again. The Subway at Walmart was looking like our best bet for food, a seat, and a chance to tie some flies. Arriving, our worst fears came true. The Subway was closed. We were out of luck. Despite the lack of the aforementioned, we also would not be able to check the stream conditions for Erie. I decided to check if Subway's wireless could be reached outside from the truck. It could not. I headed into a small room where people recycle all manner of things at Walmart. The place reeked of garbage juice, there were stains, and trash littered the floor. I promptly took a seat amidst the flotsam and discovered a source of Internet. The conditions at Erie were at an all time low. No flows and super spooky fish. The outlook for our father's chances at catching their first steelhead looked dim. We left Walmart, looking for a place to tie some flies. The McDonalds down the road had to be open. But it was not. No place was open. We drove around the small town aimlessly for quite awhile before the red neon glow of a small building caught our attention. Looming in the distance, tucked between shopping centers was a laundromat. We pulled up and had a nice laugh. Washboard Willy's was the place to be on this Thanksgiving. It was not only a place to tie our flies, but we could also dry our only set of clothes that were soaked from two days fishing in the rain. Making it even better was a small TV playing Family Guy. The colors were all messed up but it didn't matter. We found a home for the next several hours. Willy Takes A Bite Outa' Grime! After drying our clothes, Adam and I decided to tie a set of streamers for Erie. Apparently, a Rainbow Smolt pattern was pretty hot and so we busted out the necessary material and got to work. Tungsten head, holographic eyes, polar fibre, peacock, and some flashabou and mine was complete in about fifteen minutes. I then spent some time watching Adam's meticulous motions at the vice for about an hour. Adam is a perfectionist at the vice while I employ more of a blitzkrieg strategy. 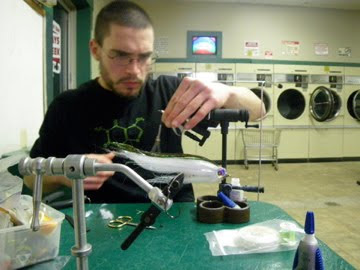 Adam is also extremely innovative because of his early days as a bass fisherman. 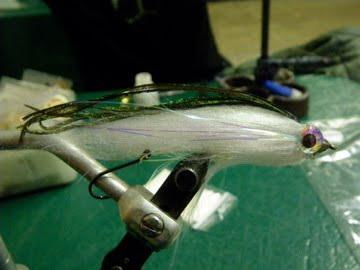 He attached some weird concoction from some old bass rig onto his fly adding enough weight to the midsection to make it sink like a rock. 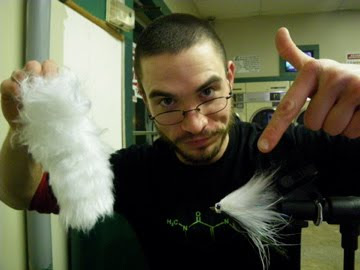 He also used an entire strip of polar fibre to make one fly. I just bought it before the trip too, was able to tie one fly with it, before on loan to Adam it systematically disappeared before my very eyes. Both flies ended up producing at Erie. Family Guy & Magic Tricks Entertained Our Tying Session. The Elusive Clump of White Polar Fibre Vanished. Towards the end of Adam's tie an old van pulled up outside Willy's. We waited with baited breath for the owner to question what the hell we were doing inside his laundromat with all manner of feathers strewn across his floor. To our relief, a family came strolling it at 10:30 to do some laundry. It was a young couple with two kids who preceded to make the place a playground. They were running around pushing laundry carts into everything they were too weak to steer away from. The highlight came when the young lad who looked like he might be a future star on Maury Povich's fat baby show came and and starred at our flies in amazement for a minute straight. He then preceded to the candy machine behind us. He pounded on the glass, screamed, yelled, and then cried for a Mountain Dew. Thankfully the father didn't cave in. 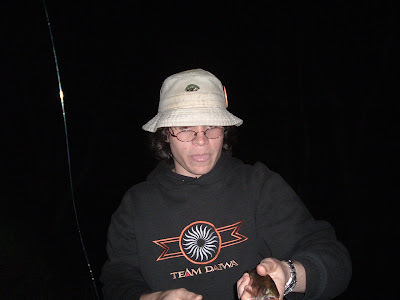 Long Black Locks, Gulligan Hat, & Proud Member of Team Daiwa. We left Washboard Willy's and headed back to the Walmart where we slept amongst an eager crowd of Black Friday shoppers. The place was packed from when we went to bed until we awoke at 3 a.m. The long drive to Erie beckoned and we hit the road. The Final Picture is Definitely Uncalled For...so out of place...I wish I still had that team diawa hoodie..